Okay, I know what you’re thinking. “I can’t make something as complicated sounding as spring rolls”. Can you roll a burrito? Can you make a lunch wrap? Yes? Then you can make a spring roll. No? Sure you can, I believe in you. 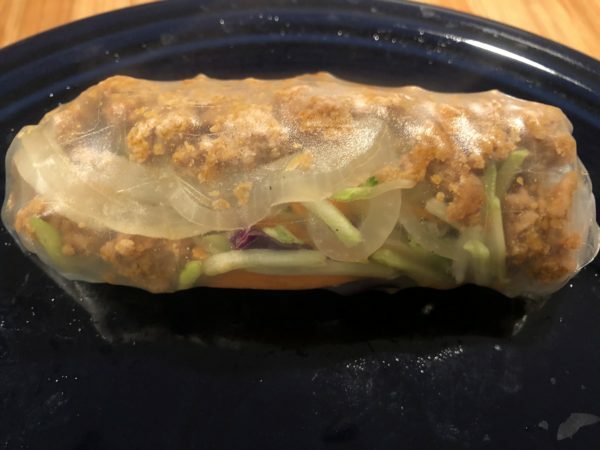 How about Sloppy Joe Spring rolls. Korean meets Midwest. Just as sloppy, but with an Asian twist. Quick enough for a weeknight, and the recipe is flexible enough to accommodate everyone. Combine slaw mix with juice of one lime and heavy pinch of salt. Stir and set aside. In large saucepan over medium high heat with a tablespoon of your favorite saute oil, brown meat, 7-8 minutes. As the meat cooks, mince garlic and ginger and combine with gochujang, soy sauce, honey, corn starch, and juice of remaining lime. Pour sauce into pan with meat and cook 1-2 minutes. Assemble spring rolls: this 2 minute video (referenced below**) by good guy Jeff Mauro is worth 10000 words on technique. Just know that you’ll probably lose the first roll, and its okay to double wrap a roll. Serve immediately with a side of soy for dipping.